This oceanfront resort, located on Kaua`i's sunny south shore within the world-famous Poipu Beach Resort area, features an oceanfront pool perched above the surf, overlooking a Hawaiian green sea turtle sanctuary. All suites at this resort offer breathtaking ocean views, full kitchens, FREE high-speed internet access, large private lanais and washers/dryers. Castle Poipu Shores offers tennis, golf, mountain biking, and horseback riding nearby. Watch the blue surf crash into black lava rock. Dive into the pool or take a walk along the sun-drenched stretch of white sand. 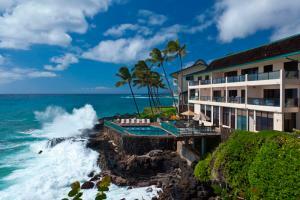 Set on a bluff in South Kauai, the complex is 1 mile from Poipu Village. A kitchen in each unit, barbecue grills and restaurants nearby. Golfing, Helicopter and Airplane Sightseeing, Hiking and Biking Trails, Snorkeling and Parasailing.